Vw = reservoir volume at the time of the breach, per unit of downstream channel width (Vw = 27000, 54000, 108000 m3[/ m]). So = downstream channel bed slope (So = 0.01, 0.001, 0.0001). qr = reference unit-width discharge (qr = 5 or 10 m2s-1, depending on Vw ). Ponce, V. M., A. Taher-shamsi, and A. V. Shetty. 2003. Dam-breach flood wave propagation using dimensionless parameters. ASCE Journal of Hydraulic Engineering, Vol. 129, No. 10, October, 777-782.
qp = peak discharge, per unit of channel width, immediately below the damsite (initial values at the damsite are qp = 5, 10, 20 o 40 m2s-1, depending on Vw ). qp/qr = ratio of peak discharge to reference discharge (initial values of 1, 2, and 4). 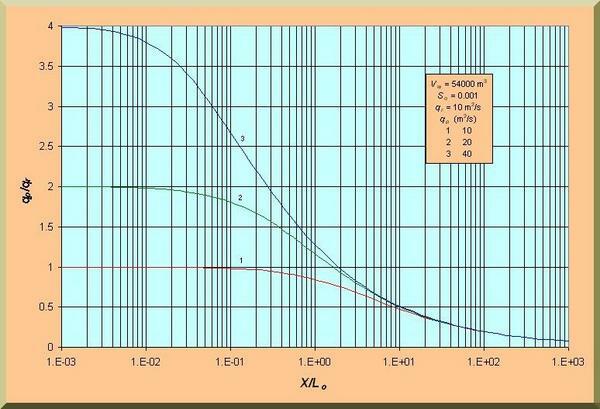 Lo = reference channel length, i.e., the ratio of reference flow depth do to channel bed slope So (Lo = do / So ). X /Lo = distance or length, along downstream channel, normalized with respect to the reference channel length Lo. Given: Vw = 54,000 m3/ m; So = 0.001. Figure 2 (b) shows the relations qp/qr vs X /Lo for various slopes and qr = 10 m2s-1. The ultimate normalized peak discharge (qp/qr )u = 0.375 corresponds to the ultimate normalized distance (X /Lo ) u = 20. The ultimate peak discharge (qp )u = 0.375 × qr = 0.375 × 10 = 3.75 m2s-1. A value of Manning n = 0.05 is assumed (applicable to natural conditions in middle-slope valleys). The ultimate reference flow depth is: (do )u = (3.75 × 0.05 / 0.0011/2)3/5 = 2.91 m.
(Lo )u = (do )u / So = 2.91 / 0.001 = 2,910 m.
The ultimate distance or length is: Xu = (X /Lo)u (Lo )u = 20 × 2,910 = 58,200 m ≅ 58.2 km. 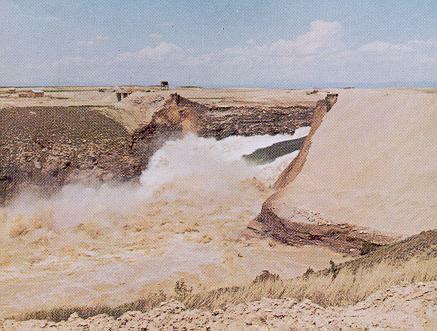 The failure of Teton Dam, in June 5, 1976, produced a peak discharge at the damsite of 2,300,000 cfs. About 100 miles downstream, the peak discharge had attenuated to 50,000 cfs, or about 2% of the original value. Failure of Teton Dam, on the Teton River, Idaho, June 5, 1976.